Sriracha Pineapple Grilled Chicken Recipe - chicken marinated in bbq sauce, mustard, Sriracha, honey and pineapple juice. Sweet, smokey and a tad bit spicy. SO good! Tons of great flavor and super juicy. We doubled the recipe for leftovers. I'm a big fan of Sriracha, so I'm always trying to incorporate it into recipes. This Sriracha Pineapple Grilled Chicken is ridiculously good. It isn't really spicy despite having Sriracha in the marinade. I think the pineapple juice really mellows it out. You can adjust the Sriracha up or down according to your heat tolerance. I always air on the heavy side, much to Chicken Legs chagrin. That being said, he also really enjoyed the chicken. I actually made him a batch of this chicken to eat while I was in Belgium. He ate it all and loved it! This Sriracha Pineapple Grilled Chicken is great as a main dish or chopped up on top of a salad or in a tortilla wrap. We are big into tortilla wraps right now. We like hot chicken wraps. I have a sandwich press that I use to make the wraps. We have been grilling extra chicken for our wraps. We are totally addicted!! 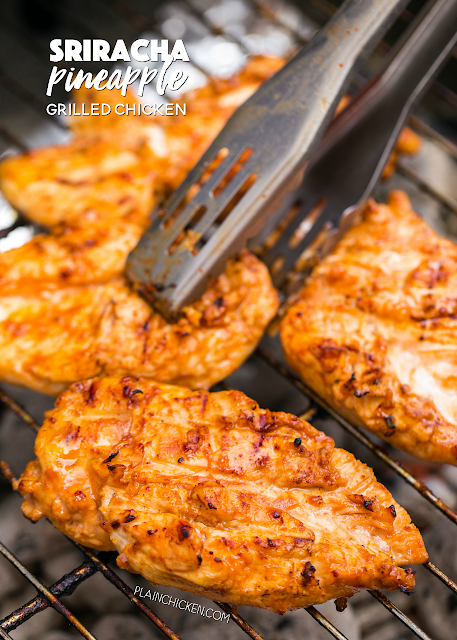 Don't forget to pound your chicken breasts to an even thickness (pound the hump out) so the chicken cooks evenly. You don't want dry chicken!! Whisk together BBQ sauce, Sriracha, honey, mustard and pineapple juice. 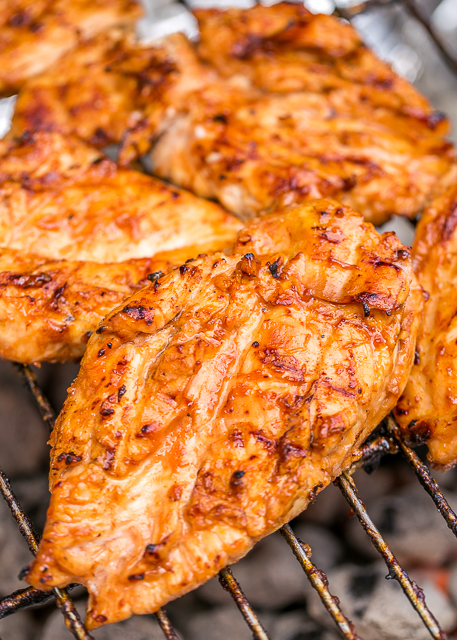 Place chicken in a gallon ziplock bag and pour marinade over chicken. Refrigerate a few hours to overnight. 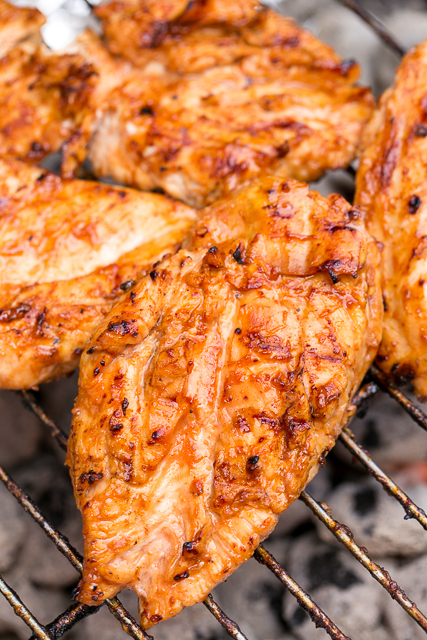 Remove chicken from marinade and grill for approximately 15 minutes, until done.